Click to here to listen! "Watch therefore, for ye know neither the day nor the hour wherein the Son of man cometh." Matthews 25:13." "In this study we will examine the Biblical perspective concerning the setting of dates. We will also look at some of the claims made and how Scriptures were pulled out of context to support these claims. The Word of God commands that we study to show ourselves approved that we may be able to rightly divide the Word of truth." The church has gone through another date-setting episode, the dates that were set have come and gone. History has proven throughout the course of time that those who claim to know when Christ would return to Rapture the Church, have all missed it, and the tragedy of it all is, that there will be others to follows. 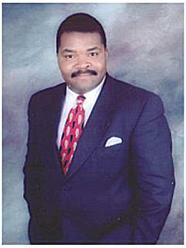 who wrote two books entitled "On Borrow Time and The Rapture 1988, and 88 Reasons Why?" In his books he graphically mapped the last days by dates. Since this episode in 1988 there have been at least 3 major date-setting, dates that have all come and gone, but Christ never came on the dates. Mr Camping's predictions were based on a complicated mathematical formula that tied Christ's return to the Jewish holiday of Sukkot, which ended on Sept.27th. He published a book entitled "1994?" In this book he dated the Rapture of the chruch and many other things in prophecy. Why? were these dates false? Because God said in His Word that no man, nor angel would know the actual date of Christ's return. This date is reserved only for God Himself, for any man to claim to know this date is to is to make himself equal with God. The Word of God is clear on this subject of Date-setting. To set dates on the return of Christ is to err. Because of these recent events, the church has become a laughingstock and many Christian faith were shaken by it; some had their hopes raised to high levels, only to have them come crashing down to the truth. Many even quit their jobs, and still others closed their businesses. Why have so many been shaken? 1.) Because they didn't take the time to search the Scriptures. 2.) Because they followed many church leaders and not the Word of God. 3.) Because they didn't question what was being taught by the Word of God. In this study we will examine the Biblical perspective concerning the setting of dates. We will also look at some of the claims made and how Scriptures were pulled out of context to support these claims. The Word of God commands that we study to show ourselves approved that we may be able to rightly divide the Word of truth. The theory seemed to be a logical one but not totally sound doctrine. 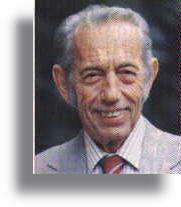 In his books he dated the Rapture of the church, the Battle of Armageddon, the 1,000 years reign of Christ, and the date of the beginning of eternity with the New Heavens and New Earth. 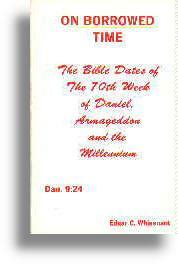 Although the Scriptures clearly places the occurrence of the these prophetic events in the near future, God had reserved the right to keep secret the dates on which they will occur. We can know that the end is close because Jesus gave us the signs of the last days (Matthew 24:3-51), but the actual dates of the events are not for us to know. Here Jesus gives clear evidence that the Christian will not know the actual date of His return. So according the teaching of Christ, neither the Christian nor the sinner will know the date. The Word of God, gives strong credence to the fact that the date of the return of Christ will not be known, nor will men be thinking of the actual day at the time of His return. This will be a day for prepared people, for those who want the be with Him. They know not the day of His return, but are ready for it whenever it comes. The Scriptures narrow it down even more when Jesus used an analogy of a man taking a far journey, comparing Himself to this man. "For the Son of Man is as a man taking a far journey, who left his house, and gave authority to his servants, and to every man his work, and commanded the porter to watch." "Watch ye therefore: for ye know not when the Master of the house cometh, at even, or at midnight, or at the cockcrowing, or in the morning:"
"Lest coming suddenly he find you sleeping." In this story, authority was given to the servants, and every man was left to his work. The porter was commanded to watch for his return. The message here implies that each servant and every man was to work until the master's return, for he might come in the evening, or at midnight, or maybe at dawn at the cockcrowing, or in the morning. They would not know the time of His coming, so their work had to be done. The warning was that He might come and find them sleeping and their business undone. Only those who had their work done would find peace. Here Jesus was stating that He would depart and leave the work of the ministry in the hands of His servants until His return. But when He would return He wanted to find us so doing His will. We are commanded to watch, but this does not mean that we should quit our jobs, or close our businesses, and go on a mountain top and look into the Heavens for His return. The watching here is referring to an attitude of heart, a heart that is ready to meet its Lord, that's been washed in the Blood of Jesus and has a full assurance of faith. A person with such a heart is doing the will of God. The Word of God speaks a blessing on the man that is found so doing at His Lord's return. (Matthew 24:46; & Luke 12:43,). In Luke 19, verses 12 through 27, Jesus spoke a parable of a certain nobleman who went into a far country. 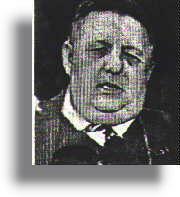 He left ten servants with ten pounds and told them to occupy till he come. In this parable, Jesus was the nobleman who was going to journey to a far country to receive for himself a kingdom and then return. We are the servants with the ten pounds. We are commanded to occupy till He return. The word occupy here in the Greek is Pragmateuomai, which means, "To busy oneself with, to trade: occupy." We are to be about our Father's business. When Jesus returns to Rapture His Church, we are to be busy for the kingdom. Again, Jesus is coming back for His will. "By faith Noah, being warned of God of things not seen as yet, moved with fear, prepared an ark to the saving of his house; by the which he condemned the world, and became heir of the righteousness which is by faith." Here we see that after Noah was warned, he began to prepare the ark. Noah didn't know when God would send him into the ark, so he kept busy working. Noah had to be ready with the ark of God. Noah had respect and reverence for God's judgement; this is what kept Noah working on the ark all those years. Only eight souls were ready for that day. as it was in Noah's day, so shall it be at the time of Christ's return (Matthew 24:36-39). "But of that day and hour knoweth no man, no, not the angels of Heaven, but may Father only." "For as in the days that were before the flood they were eating and drinking, marrying and giving in marriage, until the day that Noe entered into the ark,"
When the flood came, it fell on those who were not ready. Those who were obedient to God's will were saved (1Peter 3:20). If Noah had been disobedient to the will of God, he and his family would have been judged with the rest. The Apostle Paul warned the Thessalonians, exhorting them not to be soon shaken by what they were hearing. 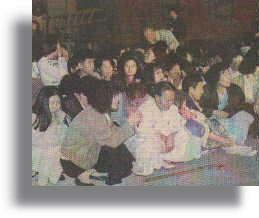 Bang-Ik Ha and his misguided Korean followers spent vast sums of money in 1992, announcing to the world that Jesus would rapture the Church on October 28, exactly at midnight. Large advertisements appeared in USA Today and other publications, telling that Jesus would come during the Feast of Trumpets and their fyugo (rapture) to heaven would take place. A South African newspaper carried a Reuters report telling of adverse reaction in Korea: "Parent groups demand that the government act quickly for fear of mass suicides across the country if the predictions prove wrong." A Mr. Lee was quoted; "in outrage and despair, these believers, especially the young ones feeling betrayed, are very likely to end their lives blaming themselves." In an article by Associated Press, dated October 29th, 1992, titled "Believers go home grumbling as deadline for 'rapture' passes". This article brought to light the true Dangers of Date Setting. "Seoul, South Korea - For months, thousands of believers proclaiming the "Rapture is coming!" stood on street corners and predicted the end of the world". "Believers had quit jobs or school and sold everything to prepare to ascend to heaven late yesterday. But early today, 15 minutes after the midnight deadline passed, worshipers were told heaven could wait. "nothing has happened," said the Rev. Chang Man-ho of Seoul's largest doomsday church, the Mission for the Coming Days. "Sorry, let's go home. Let's go back to a normal life." "God lied to us," an angry congregant said as he left another church". "There was an error. We don't know what kind of error, but there was one," one weeping woman said, clutching her 4-year-old daughter as she walked from one church". "Some 2,500 believers filed out to the Mission for the Coming Days church in disappointment, walking under the big yellow chrysanthemum arch at the entrance, pass the loudspeakers that earlier blared hymns and "hallelujahs!" There was no immediate word on whether 10,000 to 20,000 other believers at 200 other churches across the country also had gone home calmly. But anger did surface in Taegu, where the Rev. 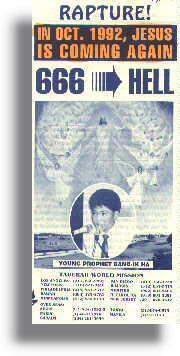 Hwang Bo-Kwan was beaten by a man who said the church had kidnapped members of his family, the Yonhap national news agency said,"
"In this book, on the title page it reads, "The Lastest messages from our Lord Jesus Christ through Bang Ik Ha, A 16 year old Korean boy" "Rapture October 1992" This book was printed here in the United States, I guesss to reach the U.S. Christians. Their were very strong and bold statements made in this book. On page 11, he writes, 1.) "It is time to wake up, and realize that we must prepare the oil and lamp to greet our Lord. 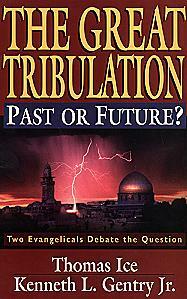 The wind that brings forth the tribulation has already started to blow. Because of the hard and difficult times we are living in, we must prepare moreover for this coming October". 2.) 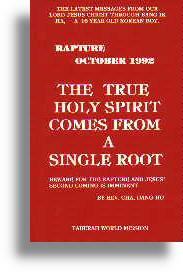 "The world's greatest blessing is participating in the glorious rapture which will occur in October 1992. The rapture and the tribulation which is te greatest tribulation that has been since the formation of any nation, is beyond our imagination and I know that I lack much knowledge I this great work of God. I also know that the Christian denominations talk of all this as being a pervert theory and also calling it a doctrine that has onlya limited time". 3.) "When this book is published, I know that many people and denominations will denounce this book and call this a false doctrine. On the other hand, there will still be many devout ministers who will come forth with many books and sermons that lead fellow Christians to the right path. I am not writing this book to book to be part of the crowd that fills bookstores with writings for their own honor and vanity. I don't have the ability, or the ealent to write a book of that nature". 4.) "I would like to emphasize once again that as this book's theme which is "Prepare for 1992," I also believe that my earthly life and ministry is prepared for and will end in 1992." 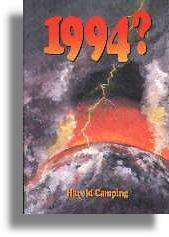 Judging from the statements made by the author, I believe he really believed that the Rapture was going to occur in October of 1992. This is why we must search the Scriptures for ourselves to see if what is taught is sound doctrine. We should judge everything we see and hear on the authority of the Word of God. When the whole thing failed on October 28, 1992, There were reports of a few suicides. It was truly a tragedy." "Date setting is not new. From the time of the Early Church until now, there have been thousands of date-setting, date-suggesting, and date-hinting schemes. All wrong. Even now, there are books and pamphlets circulating proving that Jesus will come in every year from now until the year 2001." "Date setting is a curse to the Bible Prophecy message and may prove to be more destructive to the soundness of it's teachings, than all external enemies put together." "that ye be not soon shaken in mind, or be troubled, neither by spirit, nor by word, nor by letter as from us, as that the day Christ is at hand." Judging from these verses, those of Thessalonica had been troubled by the teaching that Christ has already come. Paul told them to let no man deceive them. This is my warning to you also. Try every spirit and study every doctrine. If it is truth, it will stand the test of God's Word. Many have been hurt because of this. Many have lost crediblity in their ministry. Many have lost all hope; many hearts have become hardened to the truth. But a powerful lesson has been learned also, and it is this: we can never do contrary to the truth of God's word and be a success. Our safety is found in the Word of God and What it teaches. In closing I want to say that the coming of our Lord is soon. by the signs of the times we know that it is at hand. But the date of His return is unknown to us, so we must stay always ready. He may break through the clouds today even as you read this article. My friend, it is a fact that He will return. Mr. Whisenant, the author of the Rapture '88 theory, has been quoted by Christianity Today magazine in a interview. 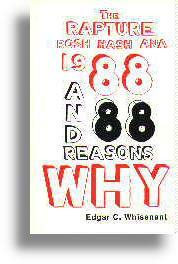 Mr. Whisenant says his prediction of September 11,12,13, 1988, was just the "shout for the Bridegroom." This, he claims, was to prepare God's children for Christ's imminent return. He has also revised his predictions on his Rapture theory. He stated that the Rapture should occur approximately one year from his last prediction. This would have made the Rapture, occur in September of 1989. Today as I revise this article it is now December 1st, 1996. We need to pray for those who would claim to know the return of Jesus. This message has really hurt the Church, when men cry wolf to many times, people become harden or instinctive to the truth of the message being taught. This page and all its contents copyright 2001 by According To Prophecy Ministries. All Rights reserved. External sites are not necessarily endorsed by According To Prophecy Ministries.